There’s no other time that I feel as though I’ve failed at life as when I hard boil eggs. 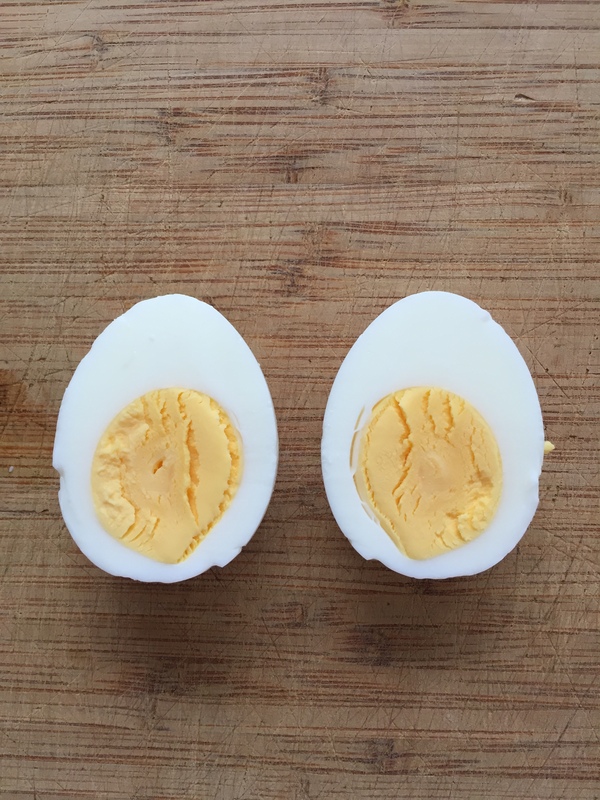 It seems like a simple endeavor: boil eggs, cool them, peel them. But usually my eggs are impossible to peel. When I asked my friends on social media why I can’t seem to successfully peel an egg, I got all sorts of egg-cellent suggestions from running them under water as I peeled them, to shaking them vigorously in a jar of water (totally didn’t work). The most frequent response I got was I was using too-fresh eggs. I dutifully tried every suggestion but got no closer to a peelable egg. Finally, I heard a new one: steam the eggs. I tried it. It worked. Here’s how to make the perfect hard-cooked egg. *note: after trying this method three times, the only successful batch was when I steamed 4 eggs. When I tried to steam 12 they didn’t get cooked through enough — but they were incredibly easy to peel! Fill your pot with about an inch of water and bring it to a boil. Place your eggs in a steamer basket and lower them into the pot. Cover, turn the heat to medium and steam for 13 minutes. A couple of minutes before the eggs are done, fill a bowl with ice and cold water. Transfer the eggs to the bowl and let them cool for 15 minutes. Looking for a good egg salad recipe? Try my chicken salad but substitute eggs! I did three eggs and they turned out perfectly but when I did 12 eggs they were underdone. I would steam them for 15 minutes if you’re going to do a lot. Welcome to Alaska Knit Nat! I have always had a passion for making useful things, whether they are knit, crocheted, sewn or randomly glued and assembled. I started Alaska Knit Nat in 2010 as a means to keep track of all the stuff I make. I live in Anchorage, Alaska where the winters are long and cold. I’m not much of an outdoorsy person, so I enjoy passing the time cooking, creating and thrift store shopping. Free knitting patterns, DIY crafts, easy recipes and more! Enter your email address to follow Alaska Knit Nat and receive notifications of new posts by email.